For the last 6 years, I have been having health issues. This is not something I often discuss in depth here on my blog for a couple reasons: I don't want to seem like I'm trying to get others to feel sorry for me and I don't want to seem like I have just resigned myself to dealing with this and that I have no hope for healing. However, I want to share for a few reasons that outweigh the reasons not to share: to ask for prayer, for others to know they are not alone, and to hopefully give people a greater understanding of chronic pain conditions. Shortly after giving birth to Lily in 2010, I started getting severe pinched nerves in my back and neck (as well as general pain in those areas), which would leave me bed-ridden for days at a time. I went to a chiropractor, got regular massages, and went to physical therapy, but nothing seemed to help much. I even got an MRI to make sure there was nothing wrong. Then, in the late summer/early fall of 2011, when I was 21/22, I felt extremely ill and literally wondered if I was dying. I had multiple troubling symptoms. I went to Ellerslie for my Basic Semester that fall and was ill the entire time. It didn't help that I wasn't getting much rest. Someone there who has a nursing background told me when I got home I should get tested for Mononucleosis (also known as Epstein-Barr Virus or EBV), so I did in December 2011. The results came back positive. I had no idea that I had been battling Mono all those months and needing rest. I always assumed Mono is something teenagers get. All my symptoms started making sense... the extreme fatigue, swollen glands, sore throat, difficulty breathing, a general unwell feeling, etc. People thought I was being lazy, but I knew that it wasn't that. The Mono diagnosis helped make me feel validated and I was relieved to know I wasn't dying, even if it felt like I was. I assumed that the Mono would go away. I had wanted to go back to Ellerslie for the Advanced Semester in January 2012, but was too sick for that, which was a big disappointment. Month after month went by, and I still felt so tired and ill. My immune system was all out of whack. Year after year went by and my health did not improve. As time went on, the pain has become chronic and widespread throughout my body. That and the extreme fatigue have felt crippling. I went to multiple doctors trying to find a diagnosis to explain what was going on with my body. Because I look young and healthy, I was made to feel by others that I was being dramatic and that it was all "in my head." I knew that the things I was feeling were real and that I was not making it up. I know what it feels like to feel healthy and strong. I ran cross-country and track for years and though it feels like a distant memory now, I remember how wonderful my body felt then. Just because someone looks young and healthy doesn't mean they do not feel as badly as they do. There are many people living with invisible illnesses. After multiple doctor visits and referrals, blood tests, and research, it was determined that I have Fibromyalgia. What is Fibromyalgia? In short, it's "a chronic disorder characterized by widespread musculoskeletal pain, fatigue, and tenderness." There are many other symptoms that can occur with it (for more on it, a simple Google search will bring up a plethora of information). What is difficult about the Fibromyalgia diagnosis is that there is no blood test to confirm it. It is diagnosed based on symptoms and ruling out other possibilities with mirroring symptoms. This can leave one feeling isolated and misunderstood. I wish at times that I had proof of this for people to understand this is real and not imagined. I was relieved to know that I didn't have something life-threatening. But how was I supposed to approach Fibromyalgia and how in the world did I get it? It has been a difficult thing to grapple with. As the years have passed, it has become harder to face as I always assumed I would get better soon. I never thought I would be someone who struggles with chronic pain. One resounding thought I've had is, "I'm too young for this." Fibromyalgia is estimated to affect around 5 million Americans ages 18 and up. It is most common in women (around 90 percent of those affected), and is especially found in those of child-bearing age. There are still a lot of unknowns about Fibromyalgia. In my research, I have discovered that Fibromyalgia is oftentimes triggered by emotional trauma and/or a virus such as Mono. I obviously have had both. It seems like the Mono never really went away, but morphed into Fibromyalgia. I am sharing all of this, not to dwell on the Fibromyalgia or have a pity-party, but rather to give the background so others can understand what is going on and how it started. It has always made sense to me that the Fibromyalgia would be triggered by emotional or physical trauma to the body. All parts of us are connected - the physical, emotional, and spiritual parts, and therefore when one or more parts are wounded, it only makes sense that it would impact us as a whole. The Lord confirmed this for me when I recently read an article that Dannah Gresh shared. She writes about a study that was done that shows how physical and emotional pain activate the same parts of the brain: "Not only do both physical pain and a break-up both hurt, but they share a common somatosensory representation as well. That means what is happening in the brain during functional MRI (fMRI) scans look much the same whether there's physical pain or the emotional pain of a break-up. How do we know? Researchers headed to the city of broken hearts: the Big Apple. No problem finding jilted lovers there. The broken hearted were stuffed into an MRI scanner and given two stimuli: a nice dose of thermal pain on their hands and a photo of their EX. (Control groups were offered what seemed the same treatment to create thermal pain, but instead of chemicals they got neutral non-irritants. No physical pain.) Didn't matter which kind of physical pain they'd experienced (or hadn't), when the brain saw that photo of the EX it started to behave like...well, like a cup of hot coffee had just been spilled! The new research offers startling possible links between a romantic break-up and long-term physical pain disorders such as Fibromyalgia)." It makes sense why I developed Fibromyalgia... the emotional pain I have experienced activated it. Unplanned pregnancy in itself is difficult, and a regretted and grieved abortion, the loss of my precious Lily, a full-term pregnancy and birth (which can impact women differently), and the severing of my relationship with Lily's father. All of these things on top of each other and happening in a short amount of time triggered the Fibro, coupled with the Mono basically pushing things over the edge. These things have taken a physical toll on me and the pain settled into my bones. The Fibromyalgia has impacted my life in many different ways... I battle fears of the future, wondering about working and how I'll carry a pregnancy to term again one day. I wonder about how I'll feel on certain days when I have plans, because I can have better days than others. I wonder if my back will give out, the most unpleasant thing I experience, because it's scary and I never know when and if it'll happen. What if it happens while I'm traveling or with people who don't understand what's going on? I don't want to be a burden to others. Exercise is extremely painful and difficult for me, and some days getting the energy to do much of anything is hard. I keep thinking about how wonderful it felt to run hard and fast, how free I felt. I truly took for granted feeling that way when I did. Now, I wish with all my heart I could exercise hard. I keep picturing myself running on a beach and praying that one day, I will be able to do that again. Dannah Gresh says "the news is rather hopeless when you look at it purely scientifically. So let's not." I think that's what is most important in this... that I recognize what is going on with my body, understand how it was triggered, and entrust my health into the Lord's hands. He knows what is going on, He understands it in a deeper way than any doctor could, and He cares more about my healing than I do. He alone can heal my heart, soul, and body. My favorite right now is Psalm 73:26 - "My flesh and my heart may fail, but God is the strength of my heart and my portion forever." My flesh is failing, my heart has been broken in many ways... BUT GOD, He and He alone is my strength. Please pray for me, that the Lord would direct me in what to do to seek healing, however that looks (apart from the things I am already doing/pursuing). Pray that He will indeed heal me. Pray that I will cling to Him through this and learn to trust Him more through this. J. I. Packer wrote "God uses chronic pain and weakness, along with other afflictions, as His chisel for sculpting our lives. 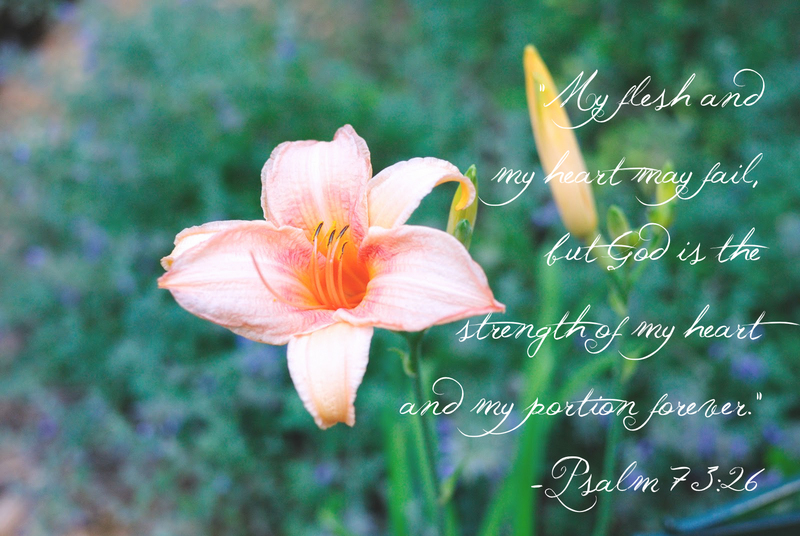 Felt weakness deepens dependance on Christ for strength each day. The weaker we feel, the harder we lean." I believe the Lord can heal me. I know that Fibromyalgia is not a life-sentence because Jesus is my Healer. I know that He can use even this to bring me closer to Himself. I know that God will give me the strength I need for what He has called me to. For those with someone in their life who has an "invisible illness," please extend grace and compassion to them. It's no less real just because you cannot "see" it or relate. And for those who are coping with and fighting Fibromyalgia or any other invisible illness, know you are not alone. Know that the Lord sees what you are going through and He is your Healer and Sustainer. Also, know I am here for you if you need someone to talk to and pray with. As you wait, keep praying for healing, but pray also for God's strength to be perfected in your weakness as long as He withholds health. There is no body so broken that it cannot be offered to God as a living sacrifice, and there is no arm too feeble to wield the sword of the Spirit. Hi Hannah, I can totally relate. I've had Fibromyalgia for at least 14 years. I had flare ups during my entire pregnancy with Matthew. And after he was stillborn from a complete placental abruption and the massive loss of blood I endured, my body and spirit was traumatized. I suffered acutely from Fibromyalgia for years and also received that diagnosis. I still have it now, but have learned to recognize my triggers better. For me, I get flare ups if I don't get enough solid sleep, if I over do it physically that day, if I don't take my high blood pressure medicine, drink coffee or have too much chocolate, and when I'm pms-ing. I've learned to minimize my fare ups by taking daily walks outside, quitting coffee and caffeine, taking physical and mental breaks throughout the day, consistently taking my medication, and taking vitamin supplements. I've found that 240mg of magnesium glycinate is awesome at relieving my aching muscles. I also take B12, EPA/DHA(Omega 3), D3, and a high quality multivitamin. These make feel a word of difference better. Advil helps too when I have pain that won't go away. I definitely suffer more symptoms in the winter when it's cold and I spend less time outside. I'm way less physically active in the winter and tend to gain weight, which also makes the symptoms worse. You may want to look into eliminating inflammatory food and substances from your diet. Giving up the coffee and caffeine has helped to improve my sleep and I no longer wake up in the middle of the night or have insomnia, and my headaches have stopped. Hope this helps and hope you'll feel better soon! Contact me in you want to chat further about it! Thanks for opening up and sharing your life with others. <3 This is so valuable for you and your friends! Praying for you! I also suffer from fibromyalgia and I know firsthand how it makes you hurt and feel tired, I often told my husband that I felt bone tired, like the tiredness was something from my very insides out. I believe my Mother had it as well, now that I look back on things. We both had lost babies and she had fertility problems. Love you & will be praying. This post really blessed me. I know a lot of what you were talking about. I think I've had fibromyalgia for many years but was diagnosed approximately 10 years ago. I was working at Walmart and was just exhausted. Not the tiredness that sleep helps. I mean totally exhausted, with muscle pain. My primary doctor diagnosed fibromyalgia. I couldn't move my right arm with out getting a lot of pain. I was taking Lyrica, it helps but I still have to be careful not to over do things. I was trying to have a child-don't know if I'll be able to do it! I lost touch with reality.I started on Health Herbal Clinic Fibromyalgia Disease Herbal formula treatment in September 2016, i read alot of positive reviews on their success rate treating Fibromyalgia disease through their Fibromyalgia Herbal formula and i immediately started on the treatment. Just 7 weeks into the Herbal formula treatment I had great improvements, my right hand pain seized and the stiffed, rigid muscle had succumbed. I am unbelievably back on my feet, this is a breakthrough for all Fibromyalgia sufferers, visit Health Herbal Clinic official website www. healthherbalclinic. net or email info@ healthherbalclinic. net.